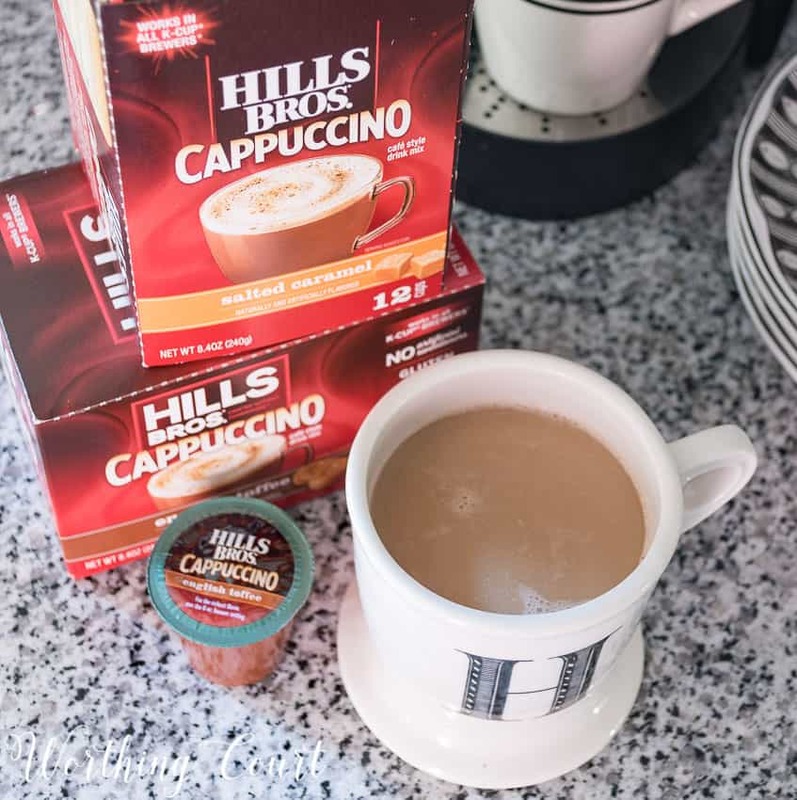 I was asked to participate in the #CappTheNight campaign, sponsored by Hills Bros. Cappuccino. Although I’ve been compensated, all opinions are my own. We love, love, love to open our home to friends here at Worthing Court! We’re coming up on the awards season – Golden Globes, Screen Actors Guild and the Academy Awards – and for us that means gathering close friends together for a fun night of award watching. Before we get started, would you like a chance to possibly win a $2500 shopping spree?!?! 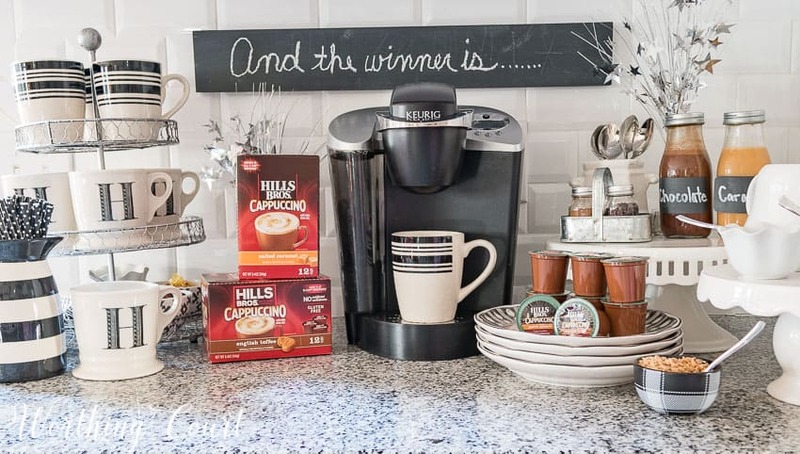 Make sure you scroll down to the bottom of the post where you’ll be able to enter the Hills Bros. sweepstakes to possibly win the shopping spree or one of six awards season prize packs! It’s an unbelievably elegant evening for all of the movie stars and movie moguls, so to have fun, “elegant awards style”, we usually enjoy a meal at a favorite restaurant and then rush straight home, where I’ve set up a coffee bar with extra special ingredients. We’ll settle in with a hot beverage just as the awards show is starting. 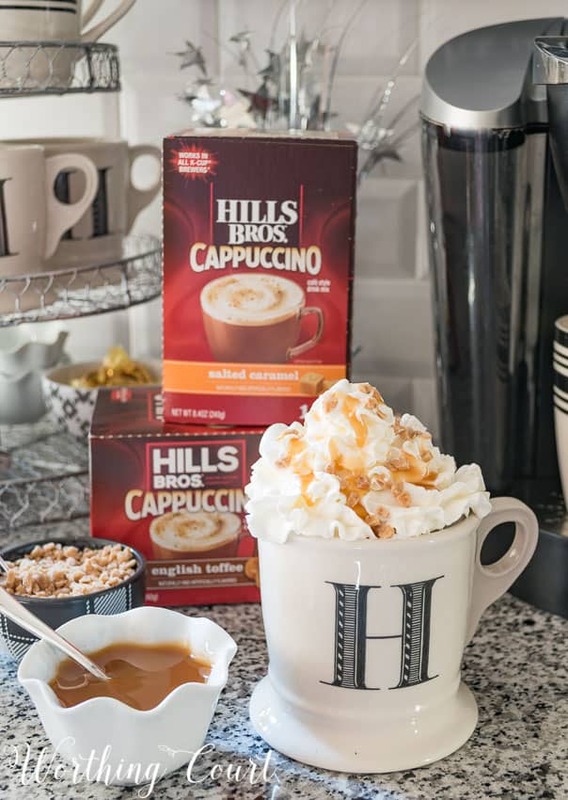 Our beverage of choice for capping off our yummy dinner is Hills Bros. Cappuccino Single Serve Cups! Don’t own a cappuccino maker? No worries – I don’t own one either. 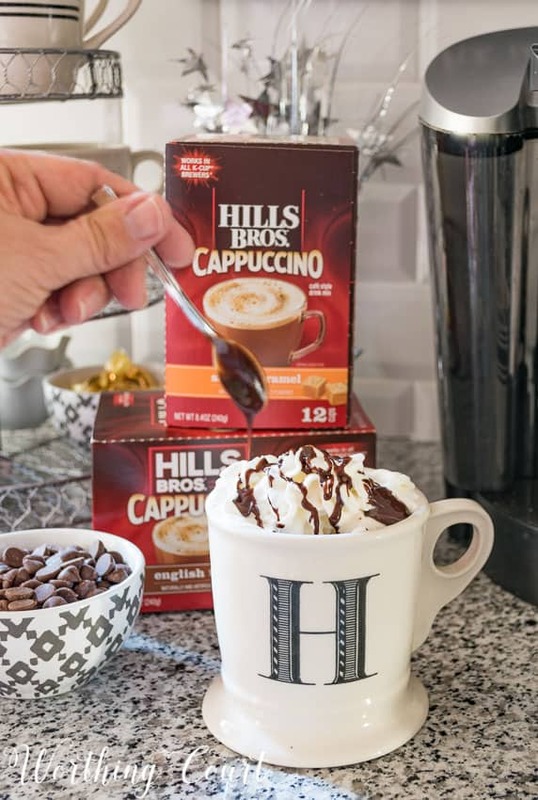 Hills Bros. Cappuccino comes in pods for Single Serve Cups that will fit into any k-cup brewer. 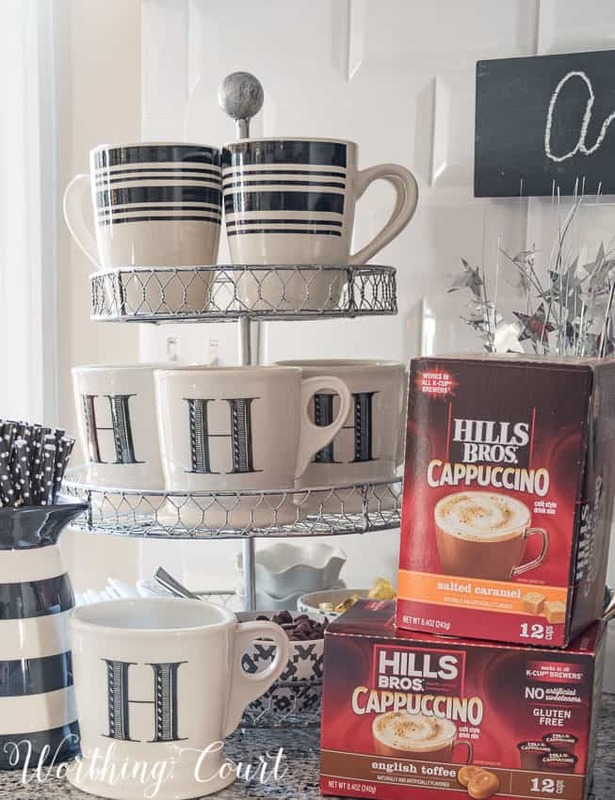 Just pop in one of the four single serve cappuccino flavors that Hills Bros. offers and you’re set! You can find Hills Bros. Single Serve Cappuccino in both 12 and 16 count packs at your local Kroger and ShopRite or you can order them online by clicking HERE. Click HERE for a $1 coupon! I made sure to include special toppings and creamers to go along with the two flavors of Hills Bros. Single Serve Cappuccino that I’m serving – Salted Caramel and English Toffee. Along with the creamers, I’ve included chocolate sprinkles, cocoa powder, chocolate syrup, toffee brickle bits and caramel syrup. To make it even more special, I’ll make a couple of homemade creamers to go along with the cappuccino flavors I’m serving. 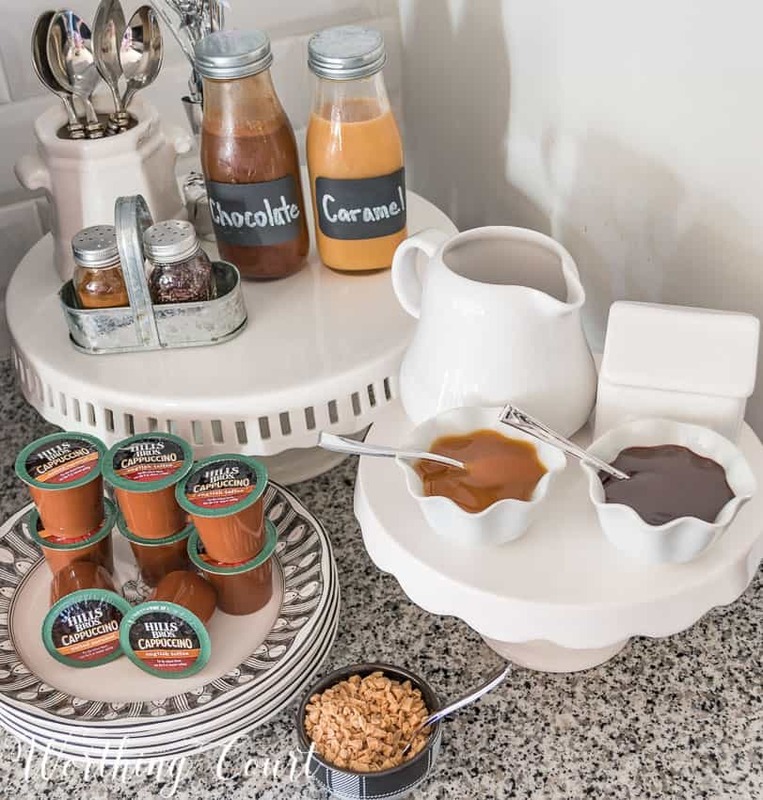 To go along with those flavors, I’ll offer homemade chocolate creamer and homemade caramel creamer. Yum! Enjoy this basic coffee creamer as it is or add chocolate or caramel flavoring as specified in the recipe. Place half and half and milk in a large saucepan. Heat until steaming, but not boiling. Add sugar to the cream mixture and stir until sugar is dissolved. If making chocolate or caramel flavored creamer, add the chocolate syrup or caramel topping now. Stir with a whisk until well combined. Pour into a container with a lid and refrigerate. The mixture can be kept for up to 4 weeks. For an extra special coffee treat - top with whipped cream. When using the chocolate flavored creamer, drizzle chocolate syrup over the whipped cream and sprinkle with chocolate chips. 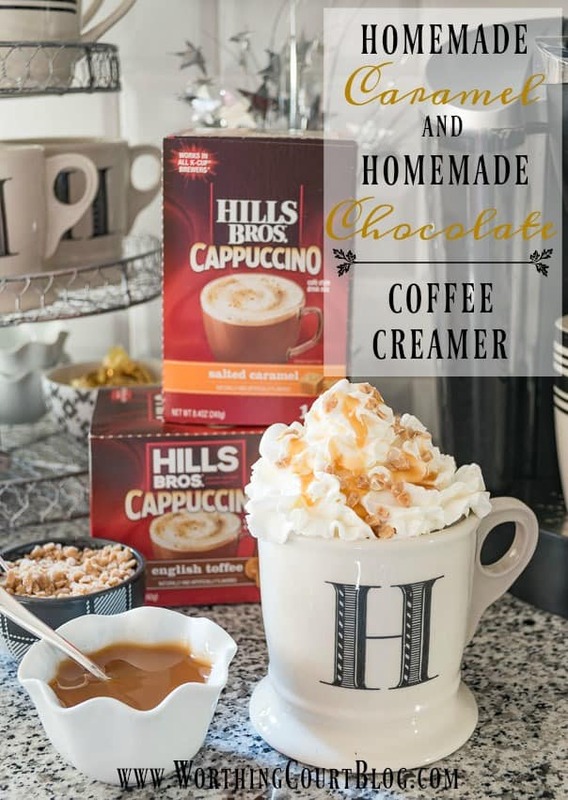 When using the caramel flavored creamer, drizzle caramel topping over the whipped cream and sprinkle with toffee brickle bits. As an extra special treat, I’ll add whipped cream to each cup of cappuccino. Then I’ll drizzle the whipped cream with either more chocolate syrup and a few chocolate chips or more caramel topping and a few toffee brickle bits, depending upon which flavor of creamer I’m using. Sweet tasting Hill Bros. Single Serve Cappuccino is deliciously free of artificial sweeteners, gluten and trans fat. Its smooth and creamy taste is perfect straight out of the coffee maker! So tell me, what do you do to celebrate during the awards season? I am definitely going to make these homemade coffee creamers! What a great idea! And it would make a great gift along with some coffee and coffee cups! This makes a special treat for my guests, thanks for sharing the recipe. Coffee creamers sound delicious. I definitely will pin this recipe. These look so yummy!!! Thanks for sharing!! Ooo! I love English toffee! May have to try this recipe! Sounds wonderful.goimg to make it soon. Sounds yummy! I will definitely be making this soon. Yay! Thanks for this recipe. My husband works for Smuckers, they make great caramel sauce! I’m not a coffee drinker, but this looks good enough I would give it a try. Will be trying this. I know u posted a couple months ago where you purchased the white wooden 3 bin coffee storage – where was it from? How fun and yummy! Will diffidently be making your creamers for the holidays. Thank you for sharing the receipts. These sound delicious. I can’t wait to try them. Your blog is full of wonderful ideas…thanks for sharing. Love the idea of the homemade coffee creamers and that they stay fresh for four weeks. I don’t think they will be around in four weeks at my house. They are too YUMMY! Yummy. Love coffee and making it like a dessert. Loved your recipes for coffee creamers. 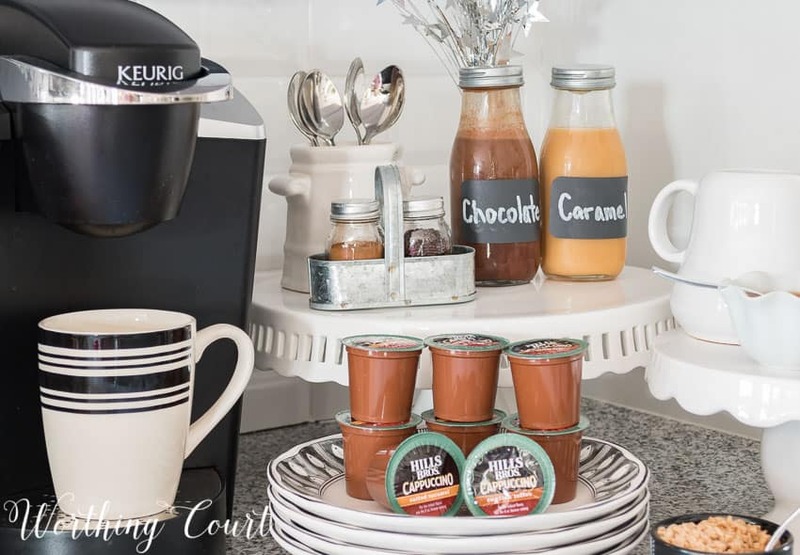 Coffee creamers can get expensive in the market when you are buying several, but by making the basic recipe you can then create your own special flavors. Thank you for sharing your creamer recipes. What a yummy treat!! Thanks for sharing!